This weekend, we've teamed up with retailer Mathers & Co. to bring you an exclusive stock sale for Retail Insider readers only. Mathers & Co. is a philanthropic clothing brand based out of Vancouver and it was founded by 20-year-old Damien Mathers. With a tagline like "threads for humanity," the aim of the brand is to help raise funds through the sale of its products. Proceeds directly benefit the philanthropic ideas and/or charities voted on by customers. Mathers & Co. is a new company with an ambitious vision. We're sure they would appreciate your support. If you would like to be part of their initiative, you may participate in their sale at the link below. Enter in promo code 'stocksale' for a surprise discount! In an ambitious plan that took just a week to complete, 11 of Overwaitea Food Group's 16 PriceSmart Foods stores in British Columbia have been converted to the Save-on-Foods banner. The announcement was officially made on February 6th and the conversion is scheduled to be completed by today (Friday, February 14th, 2014). The company will re-focus its PriceSmart Foods brand in its remaining five stores in British Columbia: Vancouver (two locations), Richmond, Surrey (the 'Fleetwood' store) and Coquitlam. These five locations will remain PriceSmart Foods stores, which will position the PriceSmart Foods banner "for future growth and evolution with a continued dual-focus on offering a low price platform with market-specific international food offerings" according to company press release. "Overwaitea Food Group", "PriceSmart Foods", "Save-on-Foods", "Vancouver"
Roots has confirmed new leases for two flagship stores in Toronto and one in Vancouver, and it is committing several million dollars in major renovations to these stores. A third flagship on Toronto's Bloor Street West will relocate. The stores include the company's two top-performing locations - one at the Toronto Eaton Centre and another at Vancouver's high-profile downtown intersection of Robson and Burrard Streets. The third store involves a relocation from 100 Bloor Street West in Toronto to a smaller location at 80 Bloor Street West. According to lease plans, the Toronto Eaton Centre Roots store is 7,665 square feet. It enjoys a high-profile location adjacent to a mall entrance, and it will neighbour the mall's flagship Nordstrom store which is scheduled to open in the fall of 2016. The Vancouver Roots store occupies the same corner as the world's second-largest Victoria's Secret store, as well as a new flagship Lululemon store which is expected to open this summer. Tesla Motors' new store will be half a block east and one of Canada's largest Sephora stores is under construction steps away. Pedestrians will continue to be drawn to the intersection and eastward as Nordstrom opens nearby in the fall of 2015. "We're particularly excited about these three flagship stores," says Roots co-founder Michael Burdman. "Each one provides an ideal showcase of the entire Roots brand for both our Canadian customers and the many foreign tourists who visit our stores in Toronto and Vancouver. Despite the phenomenal growth of our online business in recent years, our retail stores remain the ultimate, defining experience of our company." The new Bloor Street store will replace its former 15,000 square foot flagship, located a block west. The store's 6,500 sq. ft. layout is "more ideally suited to the needs of Roots in the Bloor-Yorkville area, Canada's preeminent shopping district," according to the press release. It opens in May, 2014. At the Eaton Centre in downtown Toronto, Roots will reportedly conduct a major renovation of its multi-level store, known as 'Roots Central'. In Vancouver, Roots will be expanding and renovating its Robson St. flagship store. We're awaiting further details of the Vancouver expansion and we'll report more shortly. Interestingly, Roots is also enjoying significant growth in Asia. Thanks to a partnership with Taiwan-based partner, Branded Lifestyle, Roots now has 118 stores in Taiwan and China. Branded Lifestyle plans an extensive retail expansion for Roots in Asian to take place over the next three years. "100 Bloor St. W.", "80 Bloor Street West", "Roots", "Toronto Eaton Centre", "Toronto", "Vancouver"
Lululemon founder Chip Wilson has confirmed that Lululemon will open a 4,400 square foot flagship Vancouver store at the southeast corner of Robson and Burrard Streets. It is expected to open this summer. Wilson made the announcement during his talk at the International Council of Shopping Centres conference in Whistler on January 27th, 2014. Mr. Wilson went on to discuss why he thinks Robson Street retail appears to be moving eastward towards Pacific Centre and its new Nordstrom store which is scheduled to open in the fall of 2015. He further went on to explain how Lululemon is keen on having stores on streets as opposed to in malls. We find this interesting, since Lululemon's #1-selling store is at West Edmonton Mall. Vancouver's Lululemon flagship store location was also confirmed by Glen Korstrom of Business in Vancouver Magazine, after he received verification from Vancouver City Hall regarding its approved building permit. The above photo was taken by Colin Arber. Construction has begun on two adjacent suburban Vancouver shopping centres: Tsawwassen Mills and Tsawwassen Commons. They are being constructed on land owned by the Tsawwassen First Nation. Tsawwassen Mills is expected to open in the spring of 2015. Outdoor retailer Bass Pro Shops will open a 145,000 square foot store in the complex. A 108,000 square foot Walmart and a 44,000 square foot RONA store will anchor neighbouring Tsawwassen Commons. In total, Tsawwassen Mills will include approximately 1.2 million square feet of retail with 16 anchors as well as a "unique mix of premium fashion brands, factory outlets, restaurants and first-to-market retailers, as well as a 1,100-seat food court. The development will be modelled on the successful CrossIron Mills and Vaughan Mills in the Greater Calgary and Greater Toronto areas" according to landlord Ivanhoé Cambridge. "Bass Pro Shops", "Tsawwassen Commons", "Tsawwassen Mills", "Vancouver"
Bass Pro Shops will open a 145,000 square foot store at Tsawwassen Mills in suburban Vancouver. It will be the first store location in British Columbia, and is expected to open in the spring of 2016. Bass Pro Shops currently has two Canadian store locations: one at Vaughan Mills in suburban Toronto and another at Calgary's CrossIron Mills. For those unfamiliar, Bass Pro Shops is a Springfield, Missouri-based retailer of hunting, fishing, camping and related outdoor recreation merchandise. It has about 60 American locations and the two Canadian stores mentioned above. According to its website, many more stores are planned in both countries. 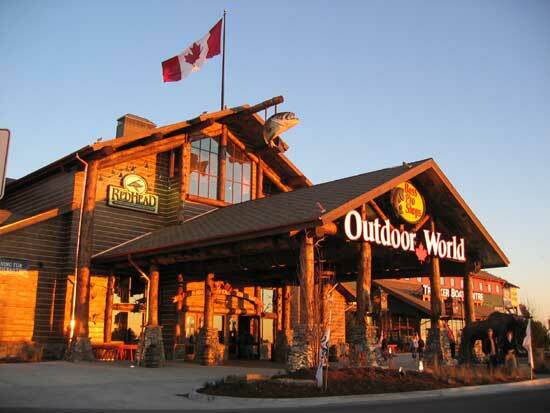 Bass Pro Shops is on a cross-Canada store expansion. Over the next couple of years it plans to open stores in Moncton, New Brunswick, Niagara-on-the-Lake, Ontario, and Kanata, Ontario. "Bass Pro Shops", "Tsawwassen Mills", "Vancouver"
store will be included on the second level.
. Photo taken by Colin Arber from the 2nd floor balcony of 755 Burrard Street in Downtown Vancouver. "Shoppers Drug Mart", "Style by Fire", "Vancouver", "beautyBOUTIQUE"
Upscale shopping appears to be moving eastward on Vancouver's Robson Street, with the scheduled opening of luxury accessories retailer Charals. The 1,100 square foot store will open in the spring at 171 Robson Street, at the base of a hotel which is under construction. The area is currently home mostly to small-scale restaurants in an area adjacent to the CBC Building and the Vancouver Public Library. Time will tell if other upscale retailers will move onto this part of Robson Street. Founded in 1986, Charals is an upscale Vancouver-based retailer of writing instruments, leathergoods and luggage. It carries such designer brands as Cartier, Montblanc, RIMOWA, Tumi, and others. This would be the second Charals location in Vancouver, following its long-time lease within Vancouver's upscale Sinclair Centre. Vancouver-based fashion designer Nancy Lord has opened her flagship store in Vancouver's 'Heritage District'. The 1,800 square foot store includes 1,350 square feet of ground floor retail as well as a 450 square foot mezzanine space. The store sells ready-to-wear women's clothing, and custom-made designs are also available. The new store is located at 410 Howe Street and is alongside such upscale retailers as Cartier and Euoko Cosmetics. Steps away are shops such as Versace and Roche Bobois furnishings. Despite having these upscale tenants, however, the neighbourhood has struggled over the past couple of years with the departure of such stores as Chanel, Hugo Boss Woman, Escada and, most recently, Mount Cashmere. We've been told that Vancouver's 'Heritage District' is looking to update its image, including sidewalks and various public-space fixtures. The area will seek to regain some of the prestige lost with the exit of some of the above retailers. We'll follow up this article when we learn of further details of the area's rejuvenation. "Heritage District", "Nancy Lord", "Vancouver"
By: Miranda Sam, Founder and Editor of Style by Fire. Sources tell us that Shoppers Drug Mart will open a 4,100 square foot standalone flagship beautyBOUTIQUE in downtown Vancouver, next to the world's second-largest Victoria’s Secret store. The street-level store will replace retailer 'Off The Wall' and will feature a Burrard Street frontage. It will compete with a new, massive Sephora store scheduled to open next winter on the 1000 block of Robson Street, only a couple hundred feet away. Shoppers first debuted its high-end enhanced beautyBOUTIQUE concept last year at Toronto's Bayview Village Shopping Centre; the second opened in the Toronto EatonCentre this past summer. Downtown Vancouver has several major cosmetic retail competitors, including Sephora. In addition to its current location at Pacific Centre, Sephora will also be opening one of its largest Canadian locations on Robson Street in the winter of 2014. Other competitors have either been upping their game or preparing for their entry into the Vancouver market. Hudson's Bay, for example, has been putting much effort into the ongoing revitalization of its Downtown Vancouver flagship store. Its expanded cosmetics floor is close to an acre in size and is now the largest in Western North America. Holt Renfrew continues to show strong cosmetics sales, and future Nordstrom and Saks Fifth Avenue stores will even further increase competition for Downtown Vancouver's cosmetics dollar. With all of these different cosmetics retailers in Downtown Vancouver, it’s hard to say whether beautyBOUTIQUE will create any extra excitement for Vancouver shoppers. Competition will be fierce. Shoppers Drug Mart already has an existing higher-end concept, Murale, though it has shuttered two of eight locations across Canada. Let’s take a look at the differences between Murale and the new enhanced BeautyBoutiques, and how the new concept might prove successful. For those unfamiliar with Murale, it is an offshoot brand launched in 2008 by Shoppers Drug Mart to move into the high-end cosmetics category. Murale’s brands include Bobbi Brown, Anna Sui, Cargo, Caudalie, Nars and more. These brands make a distinct differentiation between drug store brands such as Maybelline and L’Oréal, but share some crossover brands like Clinique and Stila. The store design is clean and minimal, with a lot of white space, and merchandising isn’t structured in aisles as in the drug store BeautyBoutiques. Introduced in 2003, the in-store Shoppers Drug Mart beautyBOUTIQUE occupy prominent real estate, many of which have separate entrances to create a different experience for cosmetics lovers. The South Granville location in Vancouver, in particular, takes up the majority of the second floor of the neighbourhood Shoppers Drug Mart. The new “enhanced” beautyBOUTIQUE takes the in-store concept one step further by bringing in higher end brands (Chanel and Yves Saint Laurent, for example) and stepping up the store design, which was inspired by a gift box, and the unravelling of a ribbon to reveal a gift. According to Shoppers, “The ribbon concept can be seen in the elements of the store design including the digital signage wrapped around the boutique and the finishing elements extending over the fixtures to the ceiling.” In a nutshell, it’s a Sephora-like experience. If one high-end Shoppers beauty concept (Murale) didn’t work out, why would the company repeat similar efforts? One reason could be because a new store like Murale might have required stronger branding support for customers to understand its relationship to Shoppers Drug Mart. On the other hand, the new high-end beauty concept is also located separately from Shoppers, and it was a great idea to leverage off the existing beautyBOUTIQUE name instead of creating a whole new brand like Murale, even though the beautyBOUTIQUE brand seems strong enough on its own. According to Sandra Sanderson, Senior Vice President of Marketing at Shoppers, in a Chain Drug Review article, when consumers heard about beautyBOUTIQUE they already had the impression it was a separate store. We don’t know whether they had done similar research with Murale. There’s also a direct correlation between Shoppers’ beautyBOUTIQUEs and its popular Shoppers Optimum rewards program. This may be a key difference between it and Murale. If consumers didn’t know Murale was a Shoppers concept, for example, there would have been less incentive to shop there. This is especially the case since Sephora has a strong Beauty Insiders loyalty program. Lastly, we’ll have to see whether the new enhanced beautyBOUTIQUE will help drive online sales, as Amazon, Walmart, and Sephora’s e-commerce platforms are highly competitive whereas cosmetics sold at Shoppers Drug Mart concepts rely heavily on foot traffic. If the enhanced concept proves successful, it might be in Shoppers’ best interest to shutter the Murale chain and concentrate on what’s working. Either way, it will be interesting to see another beauty giant enter Downtown Vancouver’s retail landscape. Miranda Sam is the founder and editor of Style by Fire, the source for Vancouver fashion events and retail news. She is also a marketing professional who has more than 5 years of experience working in fashion marketing, retail management, social media and fashion blogging. She holds a Bachelors of Commerce from UBC with a focus on marketing and a Sustainable Business Leadership certificate from BCIT. According to the November 27th edition of the The Globe & Mail Report on Business, Saks Fifth Avenue CEO Richard Baker says that he'll open up to eight Saks Fifth Avenue stores in Canada, including suburban locations in or near Toronto, Montreal and Vancouver. Based on Baker's comments, we're providing an updated list of which suburban Canadian malls are likely to receive a new Saks store. We also have an update on potential downtown stores: they might not go into current flagship Hudson's Bay store space, after all. "He’s also weighing setting up Saks in Calgary, and in suburban Toronto, Montreal and Vancouver—up to seven or eight Canadian Saks in all, he says. He’s already negotiating for space in major suburban malls such as Toronto’s Sherway Gardens and Yorkdale." Given the above statement, we have an update on what suburban locations we think Saks Fifth Avenue could open in Canada. We'll specifically address potential suburban locations. The first two locations we'll discuss are the obvious ones which were mentioned in the article: Toronto's Sherway Gardens and Yorkdale Mall. The second two might be less obvious. We speculate that the Vancouver store location could be at Oakridge Shopping Centre, and that the suburban Montreal store could be at Le Carrefour Laval. Yorkdale Shopping Centre, Toronto: Richard Baker may be negotiating for the entire 190,000 square foot Sears store location that was recently sold back to landlord Oxford Properties. The store enjoys a prime location next to an expanded flagship Harry Rosen store and is between an upscaled Hudson's Bay and a substantially expanded and modernized Holt Renfrew store. We had initially expected a Yorkdale Saks to be established within part of Hudson's Bay's 303,000 square foot store, though now it appears Richard Baker is willing to spend substantially more money on Canadian Saks stores than we had originally anticipated. Saks could have some competition for the Yorkdale Sears space, however. La Maison Simons has expressed interest in leasing part of the space. Furthermore, the mall's landlord has also stated that it may wish to demolish Sears in order to expand Yorkdale Mall into that space as well as the adjacent parking space. Nordstrom will join Yorkdale in 2016 with a new 188,000 square foot store, in part of a 298,000 square foot mall expansion. Sherway Gardens, Toronto: Saks could occupy part (or even all) of Sherway's 225,000 Sears store location which Sears recently sold back to landlord Cadillac Fairview. We again have changed our thoughts on where Saks could go. We were expecting Saks to open a shop-in-store within suburban Hudson's Bay stores, but after last week's article in the Globe & Mail, it appears that Richard Baker is willing to spend money to build large free-standing Saks stores. We think 225,000 square feet might be a bit too large for Saks at Sherway, however - only two American Saks locations are larger than 225,000 square feet, and both are 'urban' flagships, being the Manhattan (646,000 square feet) and Beverly Hills (275,000 square feet) stores. Sherway Gardens is a sufficiently upscale mall for Saks, and it features other upscale tenants including Holt Renfrew (which may stay in the mall, despite its building a 120,000 square foot store in nearby Mississauga) and, in 2016, a 138,000 square foot Nordstrom store. Oakridge Shopping Centre, Vancouver: Saks had already been inquiring into space at Oakridge Centre, and Oakridge's landlord is looking to fill a proposed 155,000 square foot anchor store with an upscale American department store. Though it wouldn't open until some time around the year 2020, an expanded Oakridge Centre could become home to a Saks store. Carrefour Laval, suburban Montreal: Given the possibility that Saks could open in suburban Montreal, our best guess for its location would be Carrefour Laval. The mall enjoys an affluent shopping base and its landlord, Cadillac Fairview, is keen to make improvements to the mall. We're not sure if Saks could take over the mall's current Sears store, or if it would want to - the mall's Sears store is a bit removed from other upscale retailers and is itself neighboured by some more mid-market stores. We're not aware of mall restrictive covenants though it's possible that a purpose-built Saks could arrive in the mall within a few years. Besides these four suburban store locations, we expect at least three downtown Canadian Saks stores: one in Toronto (replacing Hudson's Bay at Yonge and Bloor) as well as in Vancouver and Montreal. Sources have informed us that Saks management may want to create free-standing downtown stores rather than locate within flagship Hudson's Bay stores in Downtown Vancouver and Montreal. An eighth possible Saks store could be somewhere in Calgary. We'll be watching Saks closely and we'll let you know when we learn of where Saks will open in Canada, including where possible free-standing downtown stores may be located. "Hudson's Bay Company", "Hudson's Bay", "Le Carrefour Laval", "Montreal", "Oakridge Shopping Centre", "Saks Fifth Avenue", "Sherway Gardens", "Toronto", "Vancouver", "Yorkdale Shopping Centre"
. In this interview, Clark told us about his website's phenomenal growth, and how his company allows those who live in remote Canadian locations the opportunity to purchase premium footwear. Sales are skyrocketing and forecasts predict sales of an impressive $30 million/year by 2015.
intends to capitalize on that growth. forecasts sales of an impressive $30 million. One of our first questions to Mr. Clark was about online footwear purchasing and sizing: how can one buy shoes online without trying them on? has an excellent response. It allows for free returns as well as free shipping, and it stocks well-known, trusted brands whose sizing customers may be familiar with. has warehouses in Vancouver and Toronto with about 20 employees and thousands upon thousands of pairs of shoes. The company doesn't compete on price - in fact, most of what it retails is at full price. competes with its vast selection of footwear sizes and brands, its customer service (hence its generous return policy) as well as the convenience of online shopping for those with limited access to footwear retailers. Interestingly, 40% of its customers live in rural parts of Canada where quality designer footwear is not easily found. closely, as this new Canadian company is seeing exceptional growth.
. It is expected to open sometime in the spring of 2014. Tesla has been placing most of its stores in popular shopping malls, making a Robson Street location somewhat unusual for the company.
. The Toronto store is about 2,500 square feet according to the mall's lease plans. next to the future Tesla. We're not aware of the exact size of the new Vancouver store, though we expect it will be almost as large as Toronto's Tesla. nor Tesla will confirm Tesla's new Vancouver address as being 929 Robson Street. We'll update this article when we can 100% confirm Tesla's tenancy, and we'll also let you know of any future Tesla Motors store openings in Canada. "Robson Street", "Tesla Motors", "Vancouver"
In early January, 2014, Vancouver's Max Mara store will move from 2756 Granville Street to a considerably larger space at 3025 Granville Street. 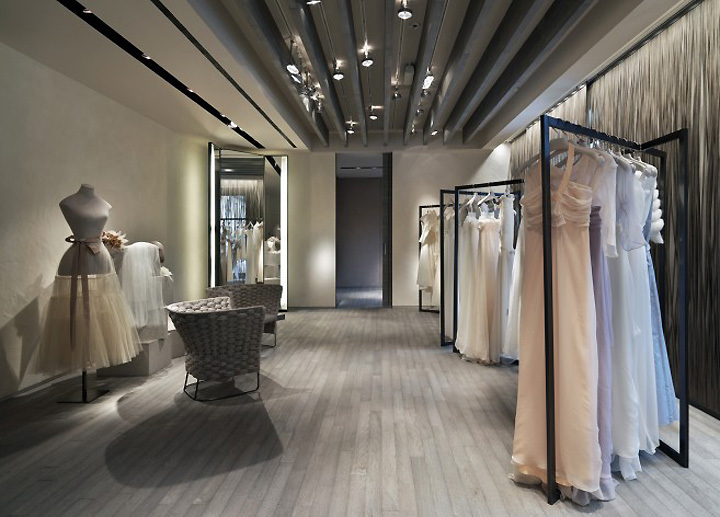 The new store will be the largest Max Mara store in Canada, and it will include the first Max Mara Bridal salon in North America. According to a press release, the new store will be about 3,850 square feet. Lease materials show the store space featuring 3,074 square feet on its street level as well as 2,683 square feet on its basement level, making for a 5,757 square foot retail building. For those unfamiliar, Max Mara is a luxury Italian fashion house established in 1951. It is known for its womenswear as well as accessories and shoes, and has stores around the world. Max Mara also retails other fashion lines including Weekend by Max Mara, which recently opened a store at the Metropolis at Metrotown. The new Max Mara store will be the largest in Canada. Max Mara only has four free-standing Canadian stores, and three of those are in Vancouver. The other Vancouver stores are located at Oakridge Shopping Centre and Pacific Centre. The Toronto store recently relocated to 151 Bloor Street West. Max Mara is also carried at selected Holt Renfrew stores as well as at Hudson's Bay's Toronto flagship. In addition, the Vancouver license holder operates two lower-priced Weekend by Max Mara stores, located at Vancouver's Oakridge Centre and Metropolis at Metrotown. Vancouver's concentration of three Max Mara stores and two Weekend by Max Mara stores gives it the highest concentration of Max Mara locations of any city in North America. Given the relatively small size of Vancouver, it could even be considered one of the world's most Max Mara-friendly cities. The new Vancouver store, being relocated three blocks to the south, will be even closer to the wealthy Shaughnessy neighbourhood, where some of Max Mara's customers live. Shaughnessy is a historical estate neighbourhood that is home to some of Vancouver's largest and most expensive residences. The current Max Mara store at 2756 Granville Street is connected to multibrand luxury retailer Boboli. Business restructuring has led to a separation between Boboli and Max Mara's Vancouver license holder, Vestis Fashion Group. Canada's first Max Mara Outlet store will open in suburban Montreal next year.